A group of international scientists, including researchers from GNS Science, has produced a new global earthquake hazard map and, for the first time, accompanying risk maps. GNS Science said the maps and associated software will set a new benchmark for developing disaster risk reduction strategies worldwide. GNS Science developed the NZ models for seismic hazard and risk that have been included in the new global model. With risk included, these models describe the impact of future earthquakes on infrastructure and people, often expressed as deaths, injuries and economic losses. These impact descriptions will provide effective information for planners and decision-makers both in NZ and globally. GNS Science said that for the first time, data behind the maps have been centrally stored on GEM’s online platform and will be accessible to a wide range of users including hazard and risk analysts, engineers, modellers, emergency planners, and the public. The new maps are derived from the most comprehensive global assessment of earthquake hazard and risk to date. 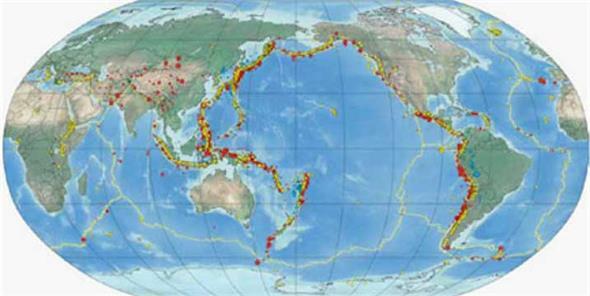 Inputs include standardised data from more than 20,000 large earthquakes worldwide in the past 110 years, information from 70,000 GPS stations around the world, specific information on major active faults, data on global building stock, and vulnerability of communities to earthquakes. GEM is a public–private partnership initiated in 2006 by the Global Science Forum of the OECD to develop global, open-source risk assessment software and tools. New Zealand, via GNS Science, has been participating in GEM since its inception in 2006. This graphic shows global seismicity (red and blue circles) larger than magnitude 6 for the period 1900-2012. Yellow triangles indicate active volcanoes. Graphic GNS Science, courtesy US Geological Survey.